Does your pet have 'separation anxiety'? 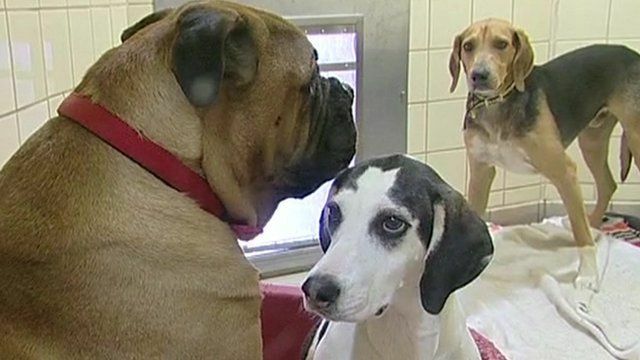 Jump to media player Vets are warning that a growing number of dogs and other pets are suffering from separation anxiety as peoples' working habits change. Primary school hires dog as teacher Jump to media player A primary school in the West Midlands has hired a new teacher with a difference. Dog helps rescuers find lost woman Jump to media player A woman airlifted to hospital after a major air and sea search in Conwy county may not have been found if it were not for her loyal dog, rescuers say. Dog saves owner after heart stops Jump to media player A dog is credited with saving the life of its owner after her heart stopped beating during her sleep. Let your dog choose your partner? Jump to media player Animal psychologist Dr Roger Mugford and his golden Labrador Bounce come into the BBC News studio to talk about how dogs read human emotions. Dogs 'can spot happy human faces' Jump to media player Scientists in Austria have found that dogs can tell the difference between happy and angry faces. Device claims to make dogs 'smarter' Jump to media player A team of US graduate students have developed a dog feeder which they believe can make pets smarter. Does your pet have 'separation anxiety'? Vets are warning that a growing number of dogs and other pets are suffering from separation anxiety. Many dogs are left at home alone while their owners are at work. Sam Gaines from the RSPCA and dog behaviourist Cathy Philips tell the BBC owners may be unaware that their pet is suffering.